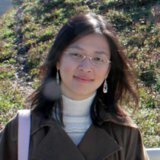 I hesitated for a long time whether or not to publish this recipe. 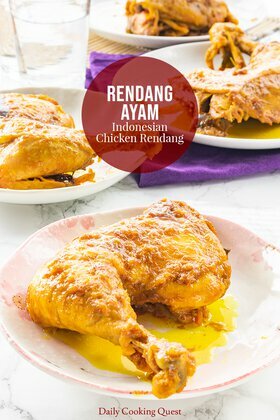 You see, this superb recipe is not mine, and decidedly non Indonesian, and non Asian too. But this oven fried chicken recipe is simply too wonderful I find it such as shame not to share. 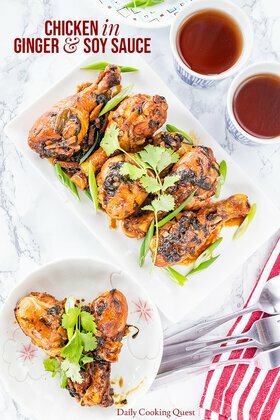 I positively cried with joy when I had my first bite, and I hope you will love this recipe as much as I do. I own two half-sheet pans in my home, and those are some of my most frequently used kitchen tools. 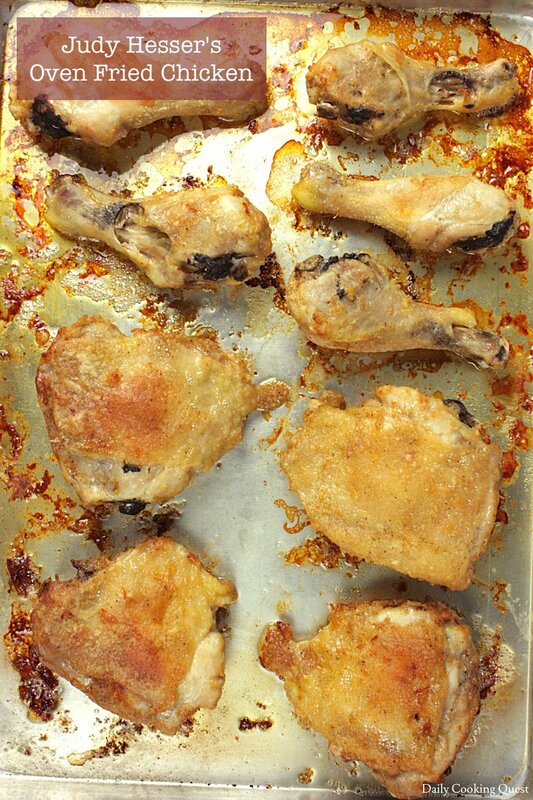 They may look pretty scratched up, banged up, and not as shiny as I first bought them years ago, but I love them just the same :) I “fried” my chicken in one half-sheet pan brushed with 2 tablespoon of melted butter, and with the chicken skin-side down. After 40-45 minutes in a 200 Celsius (400 Fahrenheit) oven, gently flip the chicken over, and bake for another 20 minutes. And that’s it! 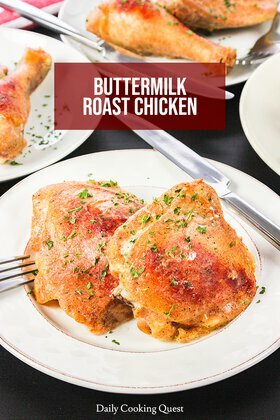 The juiciest oven fried chicken. If you don’t spill the beans, no one will even suspect they are not deep fried. Place salt solution in a large mixing bowl, add chicken. Top with enough cold water and a tray of ice cubes. Stir around so the salt solution is homogenous. Chill overnight in the fridge, at the minimum 2 hours (preferably 4 hours minimum). Preheat oven to 200 Celsius (400 Fahrenheit). Remove chicken from the fridge and pat dry. Brush a half-sheet pan with melted butter and set aside. Combine all purpose flour, salt, ground pepper, and chili/paprika/cayenne powder in a plastic bag (e.g. a gallon size ziplock bag). Add 2 pieces of chicken at a time into the plastic bag, shake until thoroughly coated. 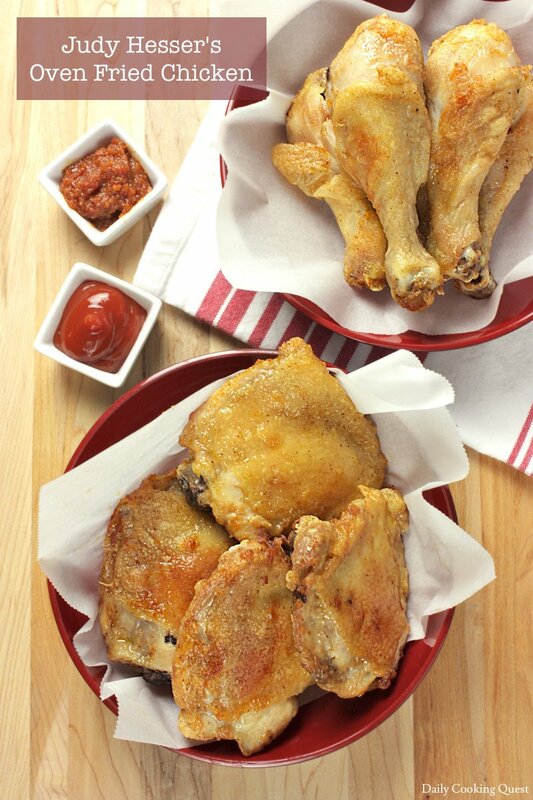 Make sure there is no excess coating to ensure crispy fried chicken! Line the chicken on prepared baking sheet, skin-side down. Bake for 40-45 minutes until the skin is browned and crispy (it may take a bit longer depends on the size of your chicken). Gently scrape the chicken with a spatula and flip to the other side. Bake again for another 20 minutes. Remove from oven, transfer to a plate lined with baking paper (or paper towel) to help remove excess oil. Best served immediately. 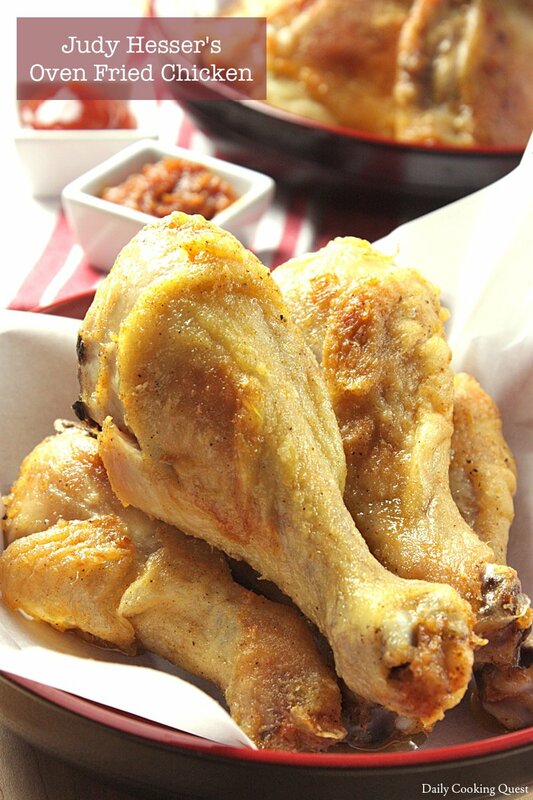 (*) 8 chicken thighs, or 12 chicken drumsticks, or 9-11 thigh and drumstick combination.